When the 20-year-old Max Beckmann moved to Berlin in 1904, it was the heyday of the Berlin Secession and a time of experimentation in the city. He quickly established himself in Edvard Munch’s studio at Eisenacher Str. 103 in the Schöneberg district; Munch was travelling in Norway. It was an odd time: the reign of Emperor Wilhelm II was at its peak, and the Secession was struggling with the question of whether to embrace the modish techniques of the Expressionists. The young Beckmann was firmly anti-Expressionist, dismissing the works of the international avant-garde, which he had studied in 1903 in Paris, as superficial and ‘decorative’. An exhibition of his work, on view at the Berlinische Gallery until February, provides an overview of Beckmann’s career from 1905 to 1937, when he emigrated to Amsterdam after the Nazis classified his art as ‘degenerate’. The exhibition proceeds in chronological order, displaying Beckmann’s works alongside those of his contemporaries: Munch, Liebermann, Franz Marc, Kokoschka, and Ernst Ludwig Kirchner. Beckmann hoped to set his monumental, impressionistic paintings against Expressionism, but his early works reveal how badly he was in control of his composition and palette. A particularly unhappy juxtaposition shows two views of the lively Nollendorfplatz – the first by Beckmann (1911) the other by Ernst Ludwig Kirchner (1912). Kirchner’s fast impasto technique, skewed perspective, and juxtaposition of yellow and dark blue evoke a newly electrified city, humming with street cars, and young Berliners enjoying the amusements of Schöneberg’s nightlife. In contrast, Beckmann’s classical composition, rendered in muted browns and greys, places the new art deco train station in the right-hand corner almost as an afterthought. It lacks the urban dynamism of Kirchner’s work entirely. The only standout work from this period is in fact his first – Junge Männer am Meer (1906), a large-scale portrait of young men by the Baltic Sea rendered in bleached washes of colour. It won the Villa Romana award and was admired by Harry Graf Kessler, an important critic and museum director whose attention and patronage launched Beckmann’s career. Beckmann’s first spell in Berlin ended with his conscription in 1914. Four years later, after a tour of the front as a medic, he retreated to Frankfurt and made some of the best works in this exhibition: a simple folder of six lithographs titled Inferno, in which Beckmann struggles to convey his terror at the end of the old German order. Inspired by the anarchy in Berlin, the lithographs caricature the war profiteers, prostitutes and small-time gangsters who populated the city’s streets and bars. Building on his early, far less successful experiments with perspective, he heaps bodies on bodies with little or no regard for depth of field. This time it works, to startling effect. 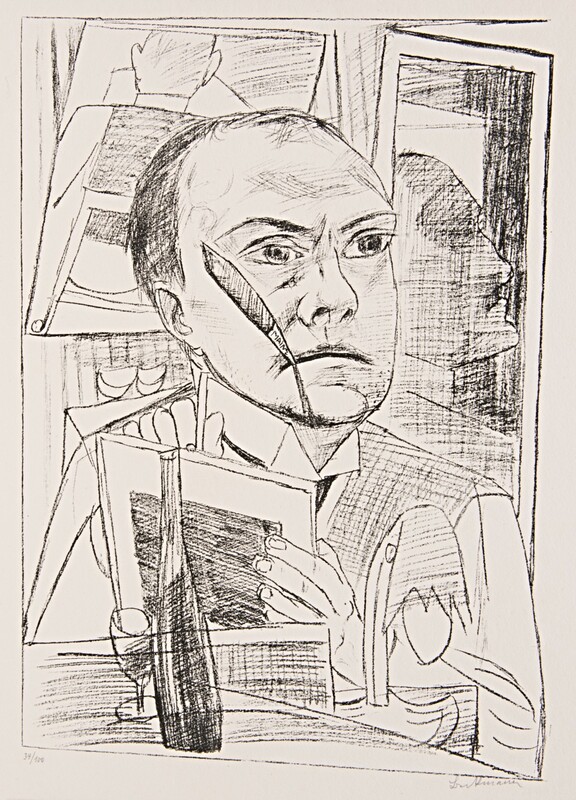 Beckmann had by this point shifted his allegiance to the Neue Sachlichkeit (New Objectivity) movement, taking inspiration from his colleagues Georg Grosz and Otto Dix and their unsentimental portraits of the Berlin demi-monde. Another series of lithographs, Berliner Reise (Trip to Berlin) details the artist’s visit in 1922, at the height of the Weimar Republic. The subjects range widely, from the artist in his hotel room to strippers on a stage. Throughout, Beckmann emphasises the ennui of these scenes: the fat businessmen, the bored girls. In 1933 the director of the Nationalgalerie Berlin, Ludwig Justi, dedicated a room to Beckmann’s works at the Kronprinzenpalais, but commercial success and critical recognition soon gave way to oppression, as the rise of the Nazi dictatorship eventually forced him to abandon the city for good. The Nationalgalerie collection, including Beckmann’s works, was confiscated and later disbanded, and the artist was removed from his post of professor at the Städelschule in Frankfurt. Beckmann, deeply hurt by this treatment and his inclusion on the list of ‘degenerate’ artists, emigrated to Amsterdam in 1937. However, it is in the work of these tumultuous years – in paintings such as Der Leiermann (1935) or Quappi mit Papagei (1936) – that we finally see the maturation of Beckmann’s painterly technique. His black linework is enhanced by his increasingly confident use of colour. Quappi, a portrait of his wife Mathilde, is a particularly clear example of how Beckmann transcended the work of his peers Max Liebermann and Ernst Ludwig Kirchner with his own Expressionist figurative style. However, it is at this point that the exhibition becomes rather sparse: Beckmann had retreated from public life and his oeuvre consequently suffered. 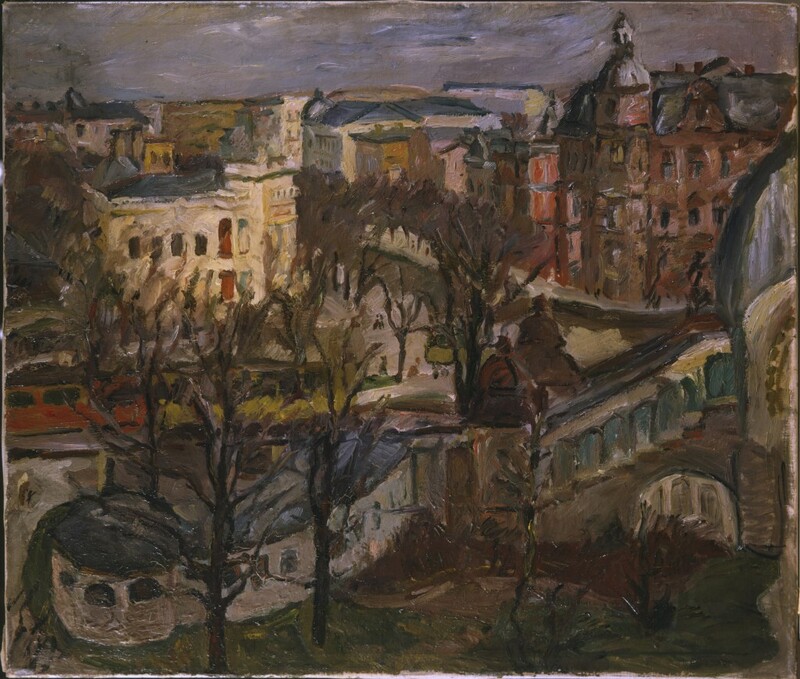 ‘Max Beckmann and Berlin’ offers a broad insight into the painter’s years before his departure to New York, and highlights the uneven development of his technique and abilities. This collection of works is something of a reminder of how slowly the artistic process can take to mature: perhaps a salutory warning about the fast judgement of young artists’ careers these days? ‘Max Beckmann and Berlin’ is at the Berlinische Galerie until 15 February 2016.